Many people have admired the iconic building with its clock tower and many more, visitors and locals alike, have been helped out by the Kingsbridge Information Centre. Located on the picturesque Quay in the heart of Kingsbridge. The party filled the building and provided a great opportunity for networking and lively conversation. Companies, activity providers, independent firms, food producers, local artists and colleagues from the area could see how their businesses where presented on the new website. She went on to thank the amazing group of volunteers that work six days a week keeping the Centre open, from 9am – 5pm. Their contribution has afforded the financial security, stability and growth of the annual destination guide. Working closely with Left Bridge and Kingfisher Print in Totnes, 50,000 copies of the highly praised guide are in circulation. 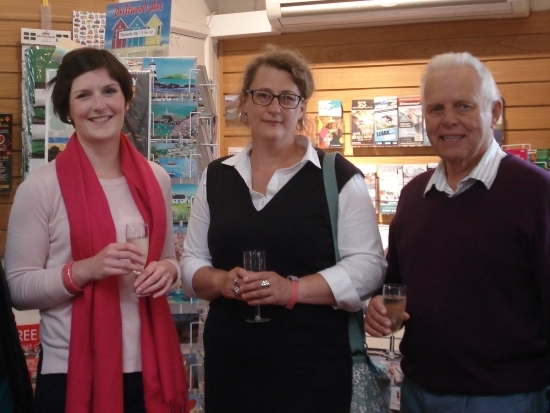 Guests enjoyed Prosecco and canapes and all were impressed with the range and diversity of products and merchandise available to buy in the Information Centre, from children’s party bag ideas to local scenic prints.